This post comes via Little Birdie Secrets, one of my favorite eclectic blogs. They often feature reader tutorials, and this is one that I just had to pass along to you... I mean who doesn’t have broken crayons at their house? 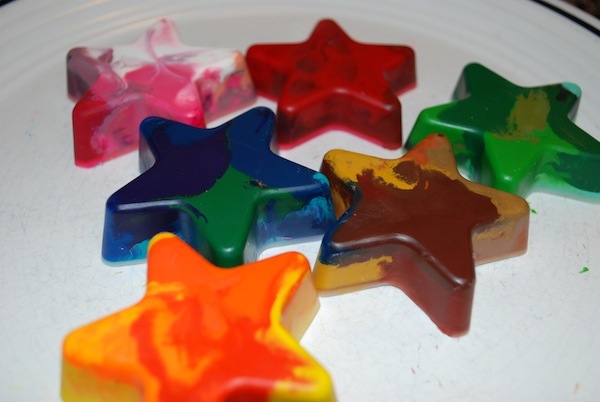 Instead of throwing them away, recycle them into fun new crayons! "First, find all your broken crayon pieces and remove the paper from each. Then break them into smaller pieces (about one third to one quarter of the regular size crayon). 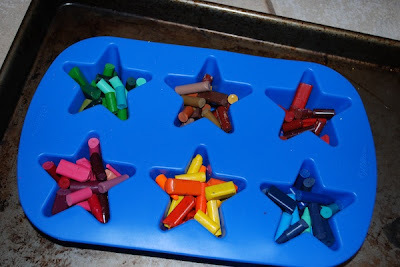 Then have your trusty assistant help you sort them by color into your favorite silicon mold (or you can use regular cupcake pans with foil liners). I chose to use a star design because I thought each point on the star would make a nice new pointy crayon.